In search of a reliable and user-friendly kitchen sink to replace the older one that is worn out? Or are you just looking for a spectacular centerpiece to remodel your kitchen around? Well, whatever you may be searching for, we might have just the right pick for you. And today we bring you an unbiased review on a kitchen sink that is one of the leaders in kitchen hardware. 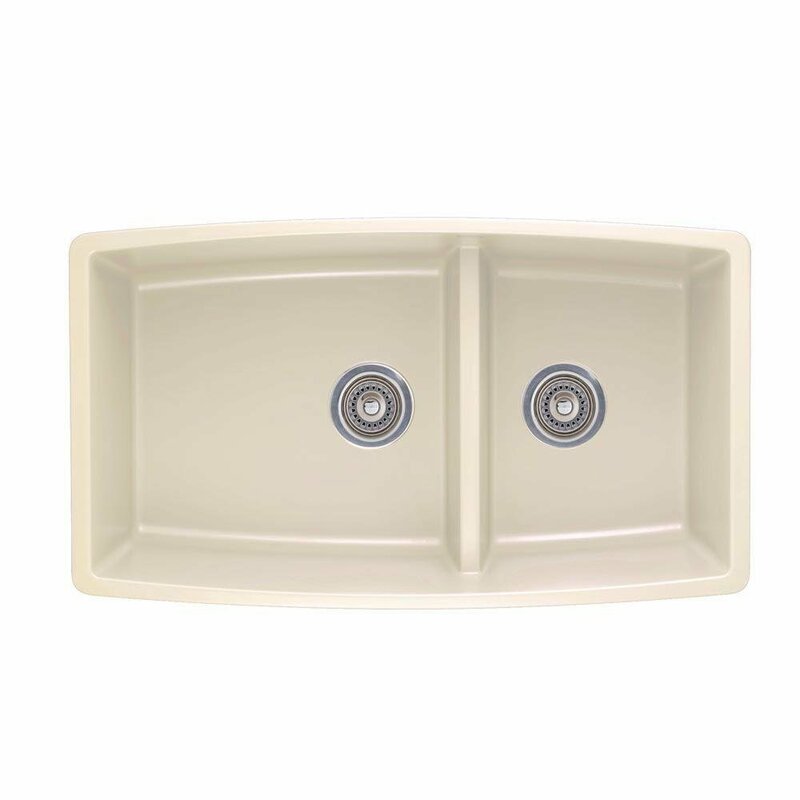 The Blanco Performa Medium Bowl Sink is one of the more durable and easy to maintain kitchen sinks out there in the market. Not only is it made of 80% granite that makes it amazingly long lasting, but it comes at an affordable price as well. And now, we hope our kitchen sink review is able to put a stop to your search and satisfy all your kitchen needs. What makes the Blanco Performa so popular? What puts the Blanco Performa a cut above the rest is how well it fits the needs of the average homeowner. Its 80% granite build keeps it sturdy and corrosion resistant, while the 70-30 split sink conveniently separates the rinsing from the cooking. And with the easy to clean properties, the Blanco Performa has been a go-to for most homeowners looking to replace their old worn out sink. Its classic range of colors from biscuit to Volga blue matches every decor while brightening the interiors at the same time. Let’s take an in-depth look at the cause of its popularity. When trying out the Blanco Performa, we put it through a number of durability tests, primarily the scratch and corrosion test. And to our delight, it passed them all with flying colors. Due to the 80% granite base, the sink is able to withstand temperatures of up to 536 degrees, and we weren’t able to burn, scorch or mark the silgranit sink no matter how hard we tried. So whether you’re slicing, dicing, mincing or chopping, nothing will be able to scratch its surface. Additionally, the rock hard granite material creates an acid-resistant surface that allows you to prepare all your favorite food without damaging the sink’s finish. This also keeps the surface stain resistant no matter what you’re pouring or spilling. In fact, the non-porous material withstands everything from black coffee to red wine effortlessly. We all know how difficult it can get to wipe off oily and acidic food stains from kitchen sinks, and this is where the average sink fails. The Blanco Performa, on the other hand, can be conveniently cleaned with just the wipe of a sponge. The sink comes with an advanced surface technology that repels water and provides a permanent protective shield against stains and bacterial accumulation. Whether it’s spilled grape juice, acidic foods, tea stains, red wine or even hair dyes, you can wipe them all easily. In fact, Blanco possesses 40% more cleanability than others in its class with its 7 patents and independent test results. During the fade test, we subjected the Blanco Performa to long hours of UV exposures under the sun. 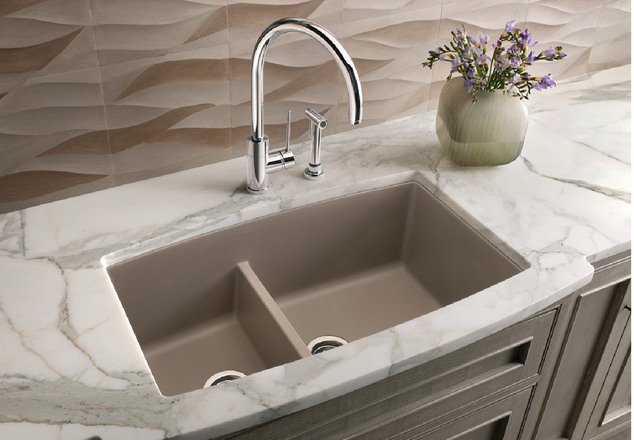 Where lesser sinks don’t stand a chance in the direct sunlight, the Blanco Performa was able to provide fantastic resistance against fading, cracks and dry outs. The color penetrates the entire product – not just the surface. So you get a consistent color that lasts a lifetime. The Blanco Performa honestly disappointed us when it came to upkeep. Though easy to clean, the granite surface still required regular maintenance or residual water along the edges would lead to stains. To clean it you should only simple-wash with a nylon brush and gentle soap or dishwashing liquid. Using abrasive cleaning tools or solutions can lead the sink surface to fade and crack. 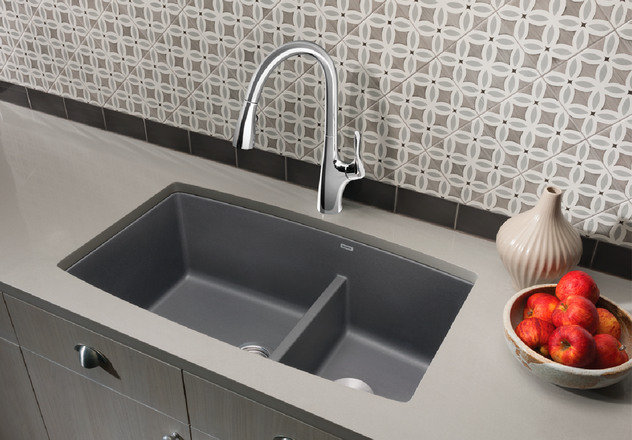 Even though weak against abrasive cleaning tools, the Blanco Performa Medium Bowl Sink is one of the most durable and corrosion resistive sinks that we had the fortune of testing out. Its smart 30-70 design comes at a fantastic and affordable rate, and is a must buy from our side. Well, that’s it for today then. See ya next time!